At the site of today's Prophetstown State Park, the great Shawnee warrior Tecumseh and his brother Tenskwatawa (the Prophet) established Prophetstown as a gathering place for like-minded Native peoples seeking to resist the impact of Europeans in the early 1800s. Believing their cultural values were being corrupted by European goods and religious influence, Tecumseh and the Prophet sought to build a community grounded in traditional Indian values. 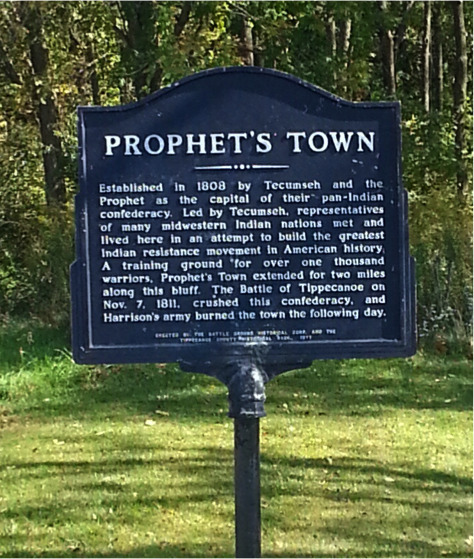 Because of its strategic location at the junction of the Wabash and Tippecanoe Rivers, they chose the site of Prophetstown for their new community. Hoping to create a pan-Indian confederacy, they invited other Indian nations to join them. The confederacy included Shawnees, Kickapoos, Potawatomis, Winnebagos, Sauks, Wyandots, and Ottawas. 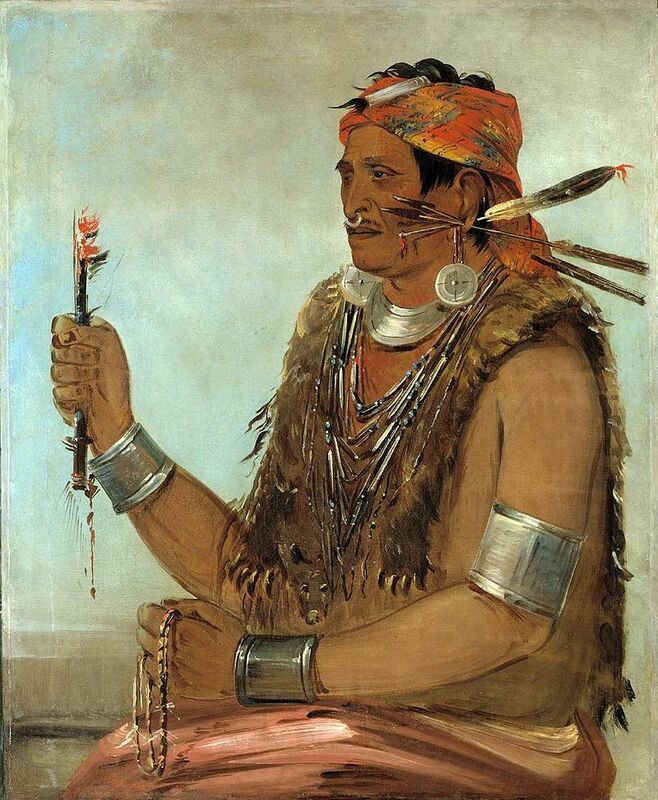 In the Fall of 1811 Tecumseh journeyed south on a recruiting mission for Prophetstown. 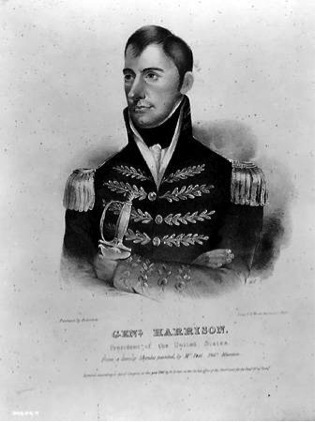 Taking advantage of his absence, Indiana’s Territorial Governor, William Henry Harrison, marched his 1,000 man army to Prophetstown to crush the Indian resistance. Having already met with Harrison and believing further negotiations would be futile, Tenskwatawa dispatched a party of warriors to assassinate the Territorial Governor. As they approached, the Prophet’s warriors were detected by Harrison’s sentries and a battle ensued. The engagement lasted for over two hours resulting in an Indian withdrawal. The following day Harrison advanced on Prophetstown only to discover that it had been abandoned. Harrison burned what remained to the ground. The Battle of Tippecanoe is widely considered to be the tipping point towards removal of Native tribes from their ancestral lands in Indiana. Following the defeat at Prophetstown, Tecumseh was able to reassemble some warriors to his cause and fought alongside the British during the War of 1812. Tecumseh died at the Battle of the Thames and did not live to see the end of the war that would result in the opening of new territory in Indiana to white settlers. Throughout the 19th century, Native tribes faced continuous pressure to move from their lands. Vast territories, once home to Native nations, became a part of an ever-growing United States, which made these lands available to American settlers and European immigrants. Tribes were relegated to considerably smaller and less viable regions and their lands, dispossessed through treaties and war, were reclaimed by a new set of characters. The Tippecanoe Battle site was named a National Historic Landmark in 1960. To learn more about this topic, check out the Tippecanoe Battlefield site here on Discover Indiana! “Prophetstown,” Discover Indiana, accessed April 25, 2019, https://publichistory.iupui.edu/items/show/135. Published on Feb 12, 2016. Last updated on Apr 2, 2019.